En garde for one of the biggest names in international urban art, when Saber’s The Ugly American exhibition starts the 2014 program at The Outsiders London gallery. The enormously well-received show was unveiled at The Outsiders Newcastle in late 2013, and travels to the capital by popular demand. The swashbuckling American is noted for his success in making traditional graffiti styles relevant to a fine art gallery context – and his effortlessly provocative executions. The latter have included the world’s largest piece of graffiti, interpretations of the usually sacrosanct Stars ʻnʼ Stripes, and using skywriting planes to daub politicised slogans above major US cities. The exhibitions predominantly abstract works in spray paint, oils and charcoal also include both Saberʼs trademark Stars ‘n’ Stripes flags on stained wood – his “OldMath” series – and depictions of the UK’s Union Jack flag too. 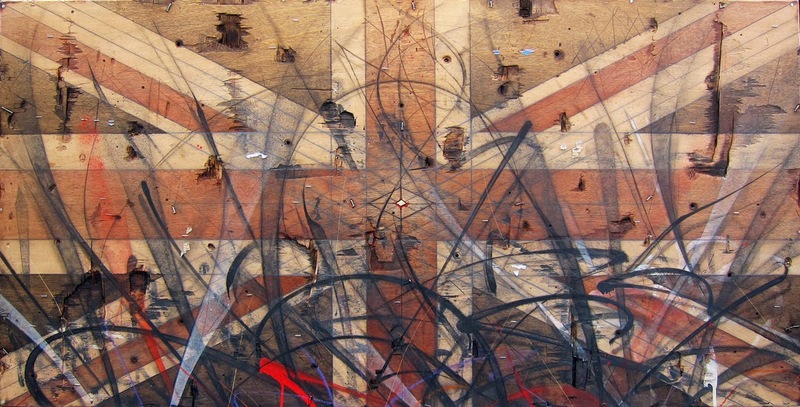 The artist’s on-going “BaseElements” works in an abstract graffiti style are also represented. The pieces come in the large-scale format Saber utilises regularly, and more manageable sizes. “My work is a continuation of certain graffiti styles developed in Southern California,” says Saber by way of description. “However, I have always been fascinated by how to adapt it for a gallery.” His unique form of abstraction is the result of a 22-year journey as a graffiti artist, and consists of multiple layers of fragmented names, hand-styles, marks, shapes and movements woven into deep layers of urban texture.